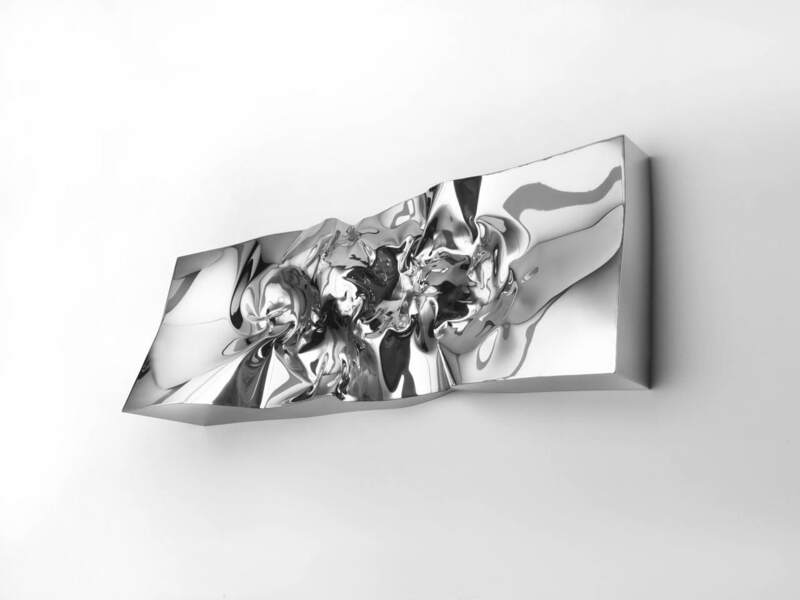 Captured Radiance, an exhibition of sculpture, functional art and high reliefs by artist Helidon Xhixha, is on view now through March 26 at the Rosenbaum Contemporary gallery, 150 Yamato Road in Boca Raton, Fla. The gallery is open Tuesday through Saturday from 10 a.m. to 5 p.m.
Xhixha, born in Durrës, Albania, is known for his unique style and innovative sculpture techniques. He discovered how to unite the power of light with steel by capturing it, transforming it through special effects using a cold press technique and ultimately setting it free. Through his process hard, resistant metal is uniquely molded by folding and turning it inside out. Xhixha’s sculptures were exhibited at the Venice Biennial in 2015. He is also renowned for his monumental public sculptures including Riflessi dal Cielo, permanently installed at the Regional Government Building in Milan, Italy; Sound of Steel installed at the Violin Museum, Palazzo dell-arte, Cremona, Italy; and The Three Monoliths installed at the Motanstahl building in Stabio, Switzerland. His work can also be found in permanent collections in Albania, Brazil, China, Finland, France, Germany, Greece, Italy, Lithuania, Russia, Spain, Switzerland, The Netherlands, the United Kingdom and the United States. Rosenbaum Contemporary, founded in 1979, is based in Boca Raton with a second gallery inside the St. Regis Bal Harbour Hotel in Miami, where additional works by Helidon Xhixha are on view. The gallery caters to international collectors interested in investment-quality works by Postwar, Modern and Contemporary masters and presents nationally recognized museum-level exhibitions throughout the year. The gallery also offers a wide range of free services to collectors worldwide including acquisition advice, art consulting, sourcing of artists, art collection building and management and resale of select works of art.